Responding to the request of the Metropolitan of Warsaw Archbishop Kazimierz Nycz and the Polish Coeliac Society, Pauline Fathers invite to the church of the Holy Spirit the faithful of the Capital suffering from the above illness. (Warsaw, corner of Dluga and Freta Streets). Since 7 December 2008, every Sunday at the Holy Mass at 11.00 a.m. – Without prior notification in the sacristy – it will be possible to accept Holy Communion in the form of the Lord’s Blood. 1. The most holy eucharistic sacrifice must be offered with bread and with wine in which a little water must be mixed. 2.The bread must be only wheat and recently made so that there is no danger of spoiling. 3.The wine must be natural from the fruit of the vine and not spoiled. Can. 925 – Holy communion is to be given under the form of bread alone, or under both species according to the norm of the liturgical laws, or even under the form of wine alone in a case of necessity. Can. 926 – According to the ancient tradition of the Latin Church, the priest is to use unleavened bread in the eucharistic celebration whenever he offers it. The Secretariat of the Polish Episcopal Conference informs that the 327th Plenary Meeting of the Polish Episcopal Conference, held in Warsaw on April 30, 2004, decided that celiac sufferers would receive Holy Communion in the form of wine. The above NOTE will be published in the “Anamnesis” bulletin issued by the Commission for Divine Worship and the Discipline of the Sacraments of the Polish Episcopal Conference. It may be given by the Ordinary bishop to the priests and lay Celiac sufferers, upon presentation of a medical certificate. Giving Holy Communion in the form of wine solves the problem of receiving It by persons with celiac disease. The faithful should report to the celebrant before Mass in the sacristy. 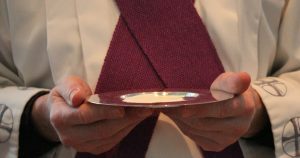 Before receiving the Holy Communion they should walk up to the presbytery, and there after the adoption of the Eucharistic forms by the celebrant they will receive the Blood of the Lord from the chalice.